Looking to promote an event to generate as much as interest as possible? Here are 5 reasons why a feather flag might be the right choice for you. If you’re planning a big event at your place of business, or at a school, or non-profit, or a church – whatever the occasion – you’ll want to make as big a splash for as little cost and trouble as possible. If standing out front with a bell shouting “Hear ye! Hear ye!” or doing calisthenics with a sign in your hand isn’t for you, you should consider ordering a customized feather flag for your event. Who doesn’t notice a well-placed feather sign? Coming in different colors, and designed to ruffle in the wind, feather signs always catch your eye. Saying more with less text than a newspaper ad, they’re on-site presence creates an immediacy no other form of advertising has. Their simplicity renders feather flags a far better use of your advertising dollar than other types of ads. Studies show that on-site advertising can increase foot traffic from between 20 to 50%. Compare that with newspapers which only amount to an average of approximately 8%, or radio or television advertising at 2 and 5% respectively. Feather flags are an easy way to promote your event in a style that works for you. Come up with your own design to put on a banner or a teardrop flag that is as simple as possible, while still getting the point across. If you’re not sure where to begin, companies that print flags will always be ready to help should you need any advice on the look, or on what might the best way for you to get the word out with your flag. There are several different styles of feather flags to choose from, with the look changing depending on the style. Some flags can be pretty small (though still impressive) at 8 feet, while the tallest teardrop flags can reach up to 14 feet. Depending on the environment – whether you want it placed indoor our out – you can choose a base with an X-stand, or a ground spike mount, and there are kits available if you want to take your flag on the road. Advertising often has a bad rep. But while some signage have a cluttering effect, feather flags – particularly with an attractive graphic – are an impressive addition to any occasion. They simply look festive. 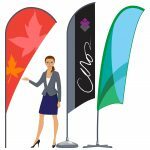 Whether using a classic rectangle banner flag, or a jazzy teardrop flag, feather flags can be an invaluable addition to your event or place of business. We wish you all the best with your business promotion!